Waterfalls, fountains, river beds, pools, water gardens, and ponds add another dimension to the home landscape. The sound of water rippling across stones or splashing against boulders paired with the site of cascading falls or gentle waves lapping across a pool transforms an ordinary backyard into something extraordinary. When considering adding a water feature to your yard or garden, consult with a trained landscaper or water feature installer. These contractors understand the correct filtration, plumbing, lighting, plant care and placement, along with maintenance and feeding of fish or other pond animals common to water gardens, ponds, and reflecting pools. A common mistake many homeowners make is installing a water feature, such as a pond, pool, or water fountain, without being adequately informed regarding the maintenance and care of such installations. Many people find they get in 'over the heads' when their pool has an algae bloom or the plants in their water garden turn yellow. A trained pond or waterfall installer can correctly diagnose and treat these and other types of ailments common to water features. They can also locate and repair possible leaks, drainage issues, chemical imbalances, and provide replacements parts. Certified pond or water garden installers can provide expert recommendations on pond plants, such as water lilies or horse tail, or on fish, such as koi or goldfish. Take some time on YardHookup.com to locate a pond, fountain, or pool installer you are comfortable with. Let them know your expectations up front and exactly what services you need. Inform the installer if you are interested in maintenance services or if you prefer to do it yourself. Water features take on many shapes, sizes, textures, and pricing ranges, accordingly. A modest pond with flagstone can start at $4,000, whereas, a roman marble fountain may cost $20,000 with installation. 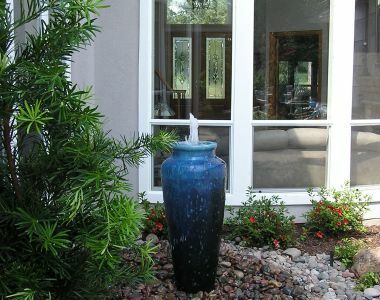 Water gardens, pond-less waterfalls, reflecting pools, and river beds are often highlighted by unique boulders, specially-selected statues, or specimen plants such as water lilies; typically, these items are not included in the price. Discuss with your water feature contractor if this is something which interests you. What kind of water feature is right for me? Some installations require extensive management while others are minimal. Consider what best suits your lifestyle. Make sure the water feature you are considering matches what your landscape can provide. A desert landscape without trees would not be suitable for a woodland fish pond. Likewise a dry river bed would look out of place within a tropical setting. Consider the location of your water feature: will there be a path leading to it, will it be easily viewed from all points in the landscape, or do you prefer it hidden and later ‘discovered’ by your visitors? Look at books, magazines, and YardHookup.com for ideas, pricing and styles. Prior to hiring, request a project portfolio and check all references. Understand all warranties and contracts prior to installation. 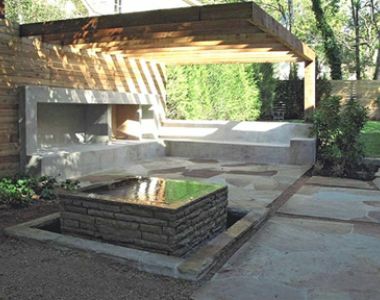 Request a detailed maintenance schedule of your new water feature. Inquire if any maintenance or follow-up services are included in your installation agreement.